3dart gives you the ability to easily add product images to your online store. And, with the built-in 3dZoom and Image Gallery features enabled, you can further improve your shopper’s sensory experience. This is important because – in traditional retail stores – shoppers can touch and even try products before purchasing. To compete with the physical aspects of the traditional shopping experience, online stores should emulate this tangibility as closely as possible. By providing depth and perspective through a series of product images, ecommerce merchants can enhance the user experience and positively influence the shopper’s purchasing decisions. The quality of your product images is a reflection of your online store’s professionalism. Images should be crisp, clear, and detailed, while also adhering to a resolution that is optimized for web use. You don’t want your images to be too small where they offer no detail, and you don’t want to have product images so big that they consume your site’s data transfer limits or fill up the user’s entire screen. Instead you want to find a good balance in the image sizing. Fortunately, when it comes to assigning product images in your store, the 3dcart Online Store Manager will automatically resize product images for you! To control the resolution that your images are resized to when assigning product images, set your large image size to a web-friendly resolution. “Web friendly” simply means that the image is large enough to offer detail, but small enough in file size to keep those data transfer limits in check. A good range to keep the images is the 600 to 800 pixel range since that will offer the best view to practically all viewers of your site whether their computer screen is big or small. By setting the large image size to your desired range, images will automatically resize when they’re assigned to products in the Online Store Manager. Furthermore, this Large Image size is the size that will display in when a shopper uses your store’s built-in 3dZoom option. So, now that we’ve gotten image sizing out of the way, let’s go over some other tips for your product images. The background of your main product image should be subtle. Try not to use patterns, textures or colors that will divert the viewer’s eyes from your product. Light or neutral colors work best for this. If you’d like to show the product in action or in its intended environment this is fine. But you should reserve that for the product’s additional images. You can add up to 3 additional images to each product or an unlimited number of images to the product’s image gallery just for these purposes. For the MAIN image however, a solid, subtle background is ideal. While we’re on the subject of additional images, let’s go over our third tip. Showing all of your product options and features. It’s hard for shoppers to properly visualize your product in a different color without seeing it. Therefore, you should try to showcase all of the product’s available options with images as much as possible. 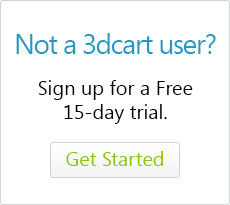 The 3dcart Image Gallery is a perfect way to accomplish this this since it allows you to assign an unlimited number of images to the product. Also, if you mention a specific feature in the product’s description, be sure to add images for it as well. For example, if you mention that a makeup compact has two mirrors, be sure to show where the second mirror is located on the product. Again, the image gallery is perfect for this. And if you plan to use additional images to showcase product accessories, be sure to clearly label the accessories as such. You don’t want to inadvertently confuse your shoppers into thinking the accessory is part of the item, which may lead to returns or bad reviews. So there you have it. Three simple but effective product image tips. When it comes to ecommerce, your web site is your showroom. Having high quality, professional images that accurately depict your products will help you sell more. So give your product images a look and take note if there are any areas you can improve.